Builder worker cutting wooden plank with chainsaw at construction site. Focus on chainsaw. When you’re just beginning to learn to use chainsaws, you may be totally overwhelmed by the choices that are out there. However, there are a slew of chainsaws that are light and slim enough for yard work yet powerful enough for commercial work. What is the best chainsaws for beginners? Find all the answers to your questions below. It’s important to buy the best chainsaw for your purposes and your budget. Read on to figure out what the best options are for you. Small chainsaws are often bought by tree and timber owners, farmers, firewood aficionados and rural property owners. When you’re just starting out, use a small, dependable saw. Using one that’s too big us a hazard and small saws can work for many large projects. A guide bar between 14” and 16” is your best bet. When asking yourself the question, what is the best chainsaws for beginners projects, you have a few different options to choose from. Here are our reviews for the best options. The Dewalt 40V Max Brushless Chainsaw is a powerful machine equipped with a brushless motor and a 16” bar. It features a variety of cutting diameters and has a cutting speed of a gas chainsaw. It makes your life easier with the LubriLinkTM auto-oiling mechanism. Makita UC3551A is a great little chainsaw for homeowners. It’s sturdy and built to last. Its 15 amp motor is ideal for many different types of jobs and its rubberized grip handles will be comfortable in your hands. This electric chainsaw cuts through wood like butter and strikes a fair balance between price, weight and cutting power. If you really need to keep an eye on your budget when you’re deciding which chainsaw to buy, check out the Remington Limb N’ Trim. This economical chain saw has a 14” bar and chain, an 8 amp electric motor, a compact, lightweight design, a push-button oiler and only weighs 6.25 pounds. It’s ideal for trimming, pruning and brush cutting. The Black & Decker LCS1240 40V has a lithium-ion 40 V battery that holds a charge for up to 18 months and that can make over 60 cuts per charge. The bar is 12” has an automatic oiling system. It’s a powerful saw made up of high quality components. The Poulan PP3516AVX Weighs 13.5 lbs and costs under $150. This inexpensive saw has great cutting speed and power. It is powered by folding up the handle on the tensioner and turning. Echo Small Chainsaws come with 14” or 16” guide bars and are great for limb and trim jobs. These cost under $300. Any reputable chainsaw you buy should last for upwards of ten years with maintenance and care. Most manufactures will provide parts for their chainsaws for about this long. Be sure to buy your chainsaw from a store that can also service it if and when you need. Buy the chainsaw that you’re most comfortable with. Most chainsaws on the market are made with new, lighter and more durable materials to make more powerful machines. The exact size you need to purchase will depend on what you’re using the chainsaw for. 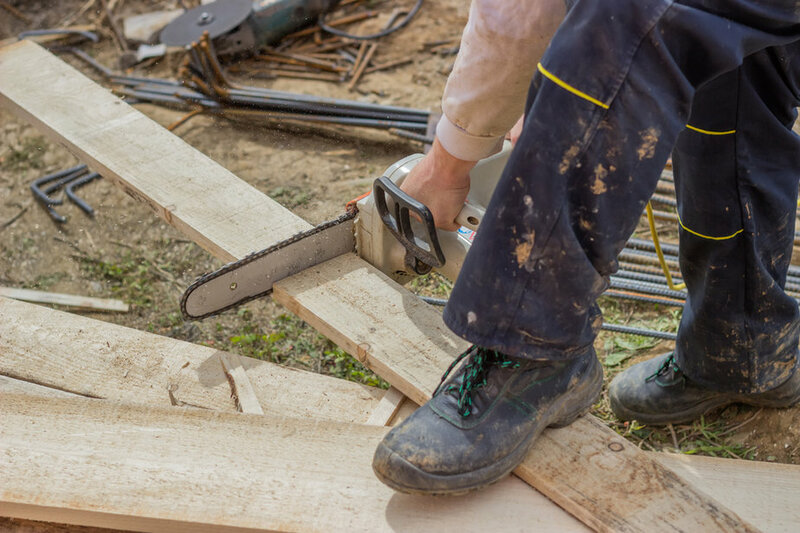 If you’ve got a big job and you use a saw that’s too small, this will likely cause you headaches, fatigue and possible injury. Knowing just what is the best chainsaws for beginners will help you immensely. Chainsaw horses allow you to have a place for the wood you want cut into lengths appropriate for a fireplace or stove. There are an array of chainsaw horse plans that are easy to follow. Horses were very common in the days before modern chainsaws. They are very simple structures that have been incredibly useful for hundreds of years. Even the most experienced chainsaw operator knows how hazardous using a chainsaw is. People can become tired or careless and logging is a very repetitive job. Using a chainsaw for long periods of time can give backaches, which can also increase the likelihood of accidents, so the use of a chainsaw horse is a really good idea. Of course, you could always purchase a chainsaw horse, but you chainsaw horse plans are simple and and easy to follow if you’re interested in building one. Wikihow has clear and concise plans to build one that should work for most needs. Survival Sherpa has a great sawbuck plan that isn’t too difficult to build. Chainsaw horses are really necessary to process the wood you’ve cut down to make it useable. You could buy one or use one of the plans above to make your own. Felling trees and cutting the wood down isn’t easy work. Chainsaws are loud, oily machines but it’s so satisfying to use one to chop a tree down and then prepare the wood for future use easily. Today’s machines are not difficult to use, are lightweight and start easily, which is much different than the chainsaws of decades ago. Most small chainsaws meant for home use will get whatever jobs you need done. Follow all safety precautions when using your new chainsaw. Chainsaw chaps, gloves, pants, helmets, glasses and hearing protection aren’t optional equipment when you’re working with your saw. These are necessary for your safety, so don’t overlook them.